Founded in 1983, Manna’s mission is to end hunger in Montgomery County through education, advocacy and food distribution. 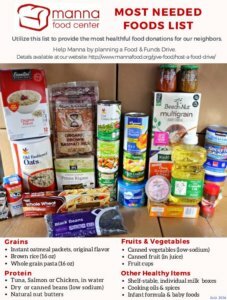 Since Manna’s founding, they have distributed more than 50 million pounds of food to more than 3 million individuals in our community, currently feeding over 3000 each month. Donate food. Click HERE for the list of requested items, or view the graphic below. Select healthy options whenever possible. Donate funds. Make checks payable to manna.org. Click HERE to donate online. Specify “Manna” in the OTHER blank on our secure payment page. Help load the truck on February 24 from 9 am – 12 noon. Contact Carol Petzold at [email protected] to volunteer.